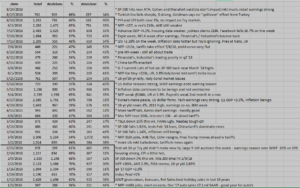 The attached spreadsheet shows the trend in “upward” vs. “downward” revisions for the SP 500, with highlighted boxes being the key weeks of earnings season when the majority of SP 500 earnings report. Note the ratio of upward vs downward revisions: although not shown, since Q1 ’17, peak earnings season has seen “upward” revisions exceed 60% for at least a few weeks of earnings. Prior to Q1 ’17, “upward” revisions usually peaked in the mid-50% range. Looking at Q1 ’16 (also not shown), “upward” revisions never exceeded 39%. Commentary: using Q1 ’16 earnings reports as an example, Street analysts are human, and tougher markets like the correction from mid-2015, to Q1 ’16, resulted in analysts being very cautious with upward revisions to their estimates exiting the Q4 ’15 reporting season. However, with the 10% “flash crash” in Q1 ’18, note how upward revisions hit 70% in the weeks of January 19th, 2018 and February 2nd, 2018, indicating that Street analysts were likely seeing corporate tax reform and the subsequent cash repatriation as ultimately a positive for the key benchmark. As you would expect, today’s calmer markets and upward trek in the key benchmarks has left analysts feeling more bullish about the future and “upward” revisions have hit 60% or more for several quarters. The point being – for readers – is that, as another data set followed, use estimate revisions as a coincident indicator rather than what I was hoping would be a leading indicator for the SP 500.